For us, corporate responsibility means sustainably and successfully managing our business. In order to further ensure that the Schaeffler Group reaches its primary goal of growing profitably and creating long-term value, value-oriented management of our business portfolio is required. In 2017, the Schaeffler Group enhanced and expanded its management approach. As part of sustainability management, we defined nonfinancial indicators that are to be used for the operational management of measures relevant to sustainability. In addition to financial performance indicators, the Schaeffler Group’s management also monitors important nonfinancial key indicators. The considerations for a Sustainability Strategy “Responsibility for tomorrow” that we further developed during this report year are based on the guidelines of the Agenda 2030 of the United Nations. The core of this agenda is a catalog with 17 Sustainable Development Goals (SDGs) equally divided into areas of society, environment, and the economy. In basing our Sustainability Strategy on the goals and timeline of the Agenda 2030, we are making clear our aspiration not only to meet legal requirements but also to make a sustainable contribution to society through our business activities. Our actions are driven by the belief that the possibilities and competences of the Schaeffler Group enable us to contribute in making the world a bit “cleaner, safer, and smarter.” Just as it is formulated in the vision of the Schaeffler Group. With this in mind, we defined 24 material topics of sustainability at Schaeffler. Four of these are focal topics that have a high priority for us: Responsibility in the supply chain, the development of sustainable products, climate protection, and the fostering and utilization of the diversity of our workforce. To achieve these priorities, we have set ourselves corresponding goals: We will continue to require and monitor compliance with Schaeffler’s Supplier Code of Conduct, to further develop our innovative portfolio of products, to further increase the energy efficiency of our production, and to further foster the diversity of our workforce. A brief magazine-style report is dedicated to each of these four focus areas in the Sustainability Report 2017 under the theme of “Our aspiration.” We thus show by means of examples how our employees are implementing and living sustainability in different ways. We know we live in a world shaped by enormous changes. The topic of sustainability is therefore becoming increasingly important. That’s a good thing! This is true for the financial sector as well. More and more institutional investors are expressing their support for the United Nations’ principles of responsible investment, and they are committing themselves to considering environmental and social aspects in addition to financial aspects when making investment decisions. 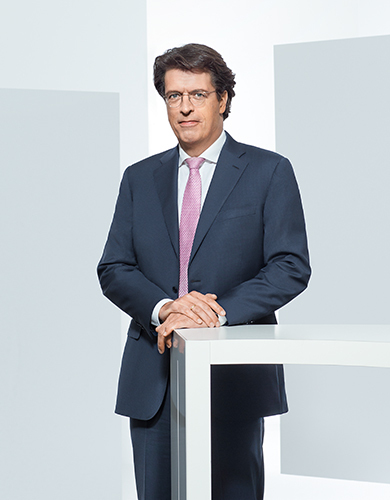 In the future, it will accordingly become even more important for Schaeffler to also communicate these additional nonfinancial aspects credibly and transparently. With this in mind, we have – for the second time – based the Schaeffler Sustainability Report 2017 on the recognized reporting guidelines of the Global Reporting Initiative in order to comply with the principles of good sustainability reporting. I hope you enjoy reading this report.